Why build SS-CMMS and make it so inexpensive to use? Back in 2010 when taking a job with a small food manufacturing company as the only Facility Engineer in the building, I quickly found the need for some type of computerized maintenance management system to assist me with my duties. This is a small family business and economic times are hard. There simply was no money for expensive CMMS software in the budget. I then started the search for cheap or free systems that just had the basics I needed, workorder tracking, PM notification and tracking, parts, easy to use and fairly flexible. I was a bit taken aback with the very few options in this field. Some of the software I tried didn't work at all. Some were just way too confusing and most online systems charged monthly fees. I then found a solution that while web based, installed on your own webserver in your business. This worked great until that company decided to abandon it's free product in favor of another charge by the month online site. That was the time I decided to stop putting off what I had pretty much figured I'd have to do from the start. Write my own CMMS. 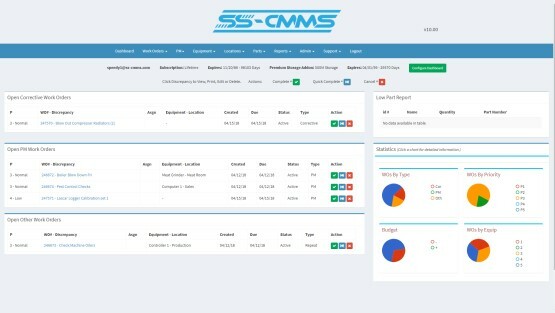 So SS-CMMS was created! It wasn't called SS-CMMS at the time, but it was working absolutely wonderfully and I loved it. During an audit, I was asked about the CMMS I was using. The auditor had other clients in our situation that were looking for a CMMS they could afford. It didn't have to be full of hundreds of features, but workorder and pm tracking were really needed. I showed the program to some other maintenance fellows and they all agreed this was something worth pursuing. I felt if I could offer an inexpensive, easy CMMS solution for us little guys, what could be better? So I cleaned up the code, made the system multi-user compatible and secure. We all hope you like it and send us your Feature Requests!